In a talk Thursday at the O'Reilly Open Source Conference, Google distinguished engineer Rob Pike blasted C++ and Java for being overly verbose and too complex. "I think these languages are too hard to use, too subtle, too intricate," Pike averred. "They're far too verbose and their subtlety, intricacy and verbosity seem to be increasing over time. They're oversold, and used far too broadly." This monstrous line of code is one I used very often in my days of graphics programming on the Mac (circa 1996). On the Mac, the all-important CopyBits() routine always examines the ctSeed field of the source and destination color tables to see if they differ. If the two seed values are not the same, QuickDraw will waste time translating color table info, which you don't want (if you're interested in performance). Hence, you use this line of code to coerce the ctSeed field of the source and destination color tables to the same value. I wrote about this and other tricks for speeding up graphics on the Mac in a 1999 MacTech article. Pike and others at Google are promoting the Go language as a solution to the compiled-language complexity problem. Lately I've been crashing the Mobile Device Crash Report Tool a fair amount. But so, too, have a lot of other people, judging from the buzz on the Googlesphere. Evidently iTunes is fussy (on Vista, especially) when it comes to indiscriminate plugging/unplugging of iPods from USB ports while a sync is in progress (yeah, I know). For crying out loud can we not have a meaningful error message, though? Repeat after me: Whisky, Tango, Foxtrot. The following code will parse through a spreadsheet and display data from the desired numbers of rows and columns in a Swing JEditorPane. since getValue() will only work if the cell contains a double-precision floating point number. To test this macro, I looked online for a sizable .csv file that I could play with. 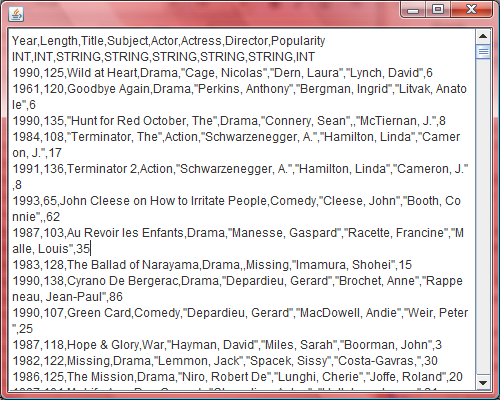 I found a free/open movie database at George Tech's website. 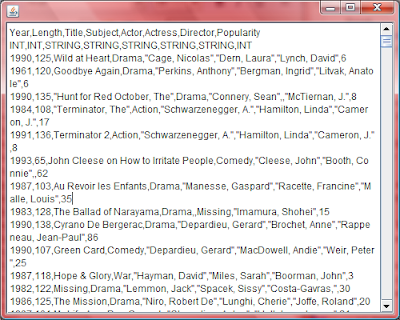 It's a comma-delimited file with data for 1742 movies ranging from 1925 to the early 1990s. It's by no means a definitive movie listing (apparently it represents one of the school's collections) but it suits my purposes just fine. I've been seeing this monolog box once in a while in Acrobat these days (not only Acrobat 10 Professional, which is still in development, but Acrobat 9 Pro as well). I can't really call it a dialog box, since it is, in fact, more of a monolog. This is what I sometimes call a Whisky Tango Foxtrot message. No doubt the underlying error condition happened due to something I did in a script. That's fine, I accept responsibility for the crash. What I don't accept responsibility for is the lameness of the error message. It's a completely content-free error message. It tells me nothing about what went wrong. It's a billboard that says, in effect, "Acrobat sometimes barfs and doesn't know why." The point of error messages should be to tell you what went wrong, so that you can fix it or work around it, or at least know that it involves something more specific than a nameless internal error. I should at least be given a code of some kind, although even that can be awfully lame, as iTunes users know all too well. Have you ever gotten the infamous iTunes -9812 error? (It's another example of a Whisky Tango Fox monolog box.) Plenty of people see this error, and they turn to Google in desperation to find out what it means, since Apple's web site is of scant help. My September 26, 2009 blog on this subject ("A Fix for the Dreaded iTunes -9812 Error") continues to bring upwards of 2000 hits a month. Why? Because Apple displays no meaningful troubleshooting information whatsoever in conjunction with the -9812 error message. It's just a billboard for iTunes' ability to barf. People have to come to my blog to find out what it means. How lame is that? Please, UI designers and programmers, provide meaningful error messages, or at least point me to a log file somewhere, where I can find out what went wrong. If the program ran out of memory, followed a null pointer, had a stack-heap collision, entered an endless loop, or choked or bad data (or whatever), just tell me straight out. I can live with the news, I promise. In the past few days I've also been spending a lot of time with Apache Sling. Imagine my relief to find that Apache Sling uses Rhino proper (js.jar version 1.6R6) rather than relying on the JRE's onboard scripting engine. This means server-side EcmaScript runs much faster in Sling than it otherwise would. But Sling's use of Rhino 1.6R6 is a big win in another way as well. It turns out 1.6R6 is the first Rhino build to feature onboard support for E4X (the EcmaScript extensions for XML, otherwise known as ECMA-357). Rhino has had E4X support for some time, but until recently it's been a patched-on kind of support relying on the external xbean.jar (which was originally created by BEA, in pre-Oracle days). Prior to Rhino 1.6R6, you had to have xbean.jar in your classpath in order to have E4X support. Now it's built-in. No more need for xbean.jar. So it turns out you can use E4X grammar in your server-side scripts for Sling, which, I gotta say, is a huge turn-on (if you're as big a geek as I am). I'll be blogging more about E4X in Sling in coming days at dev.day.com. In the meantime, I thought I'd leave you with a quick example of what you can do with E4X on the server side. As I say, I'll be writing more about this sort of thing on dev.day.com soon. Watch that space. In the meantime, if you're new to E4X, I recommend taking a look at this article on IBM's Developerworks site. It'll get you up-to-speed quickly. After yesterday's exercise comparing the execution speed of Rhino-standalone versus Rhino-embedded-in-JRE, I decided to carry out a couple more performance investigations. Execution time (not speed, but time; higher values are worse) is plotted vertically. The surprising result? Firefox's C++ interpreter is not all that much faster than standalone Rhino. The Y-axis here goes from zero to 1200 milliseconds. Trials, on the X-axis, run from zero to values of 200000, 400000, 600000, 800000, and 1000000 for the terms argument to yesterday's pi() function. So in other words, it took Rhino 1212 milliseconds to calculate pi from a million terms, whereas it took Firefox/Spidermonkey 984 ms to do the same thing, making Firefox's interpreter about 20% faster. Rhino comes out looking quite good, considering it is, after all, "only Java." Astonishingly, Acrobat's interpreter was a full order of magnitude slower than Rhino, requiring 11765 milliseconds to calculate pi from a million terms (versus 1212 ms for Rhino). Why so slow? I have no idea. Perhaps someone from Adobe can comment. Bottom line: Don't assume that because something is written in Java, it's (automatically) slow. It depends on the runtime environment and what it is, exactly, you're trying to do. I first noticed the speed difference between regular Rhino and JDK Rhino back in February when I was testing a script that manipulates images. (See my blog post, "Voronoi tessellation in linear time.") In one situation, I found that running my script using the JRE's interpreter took two full minutes, whereas the same script finished in six seconds when I used js.jar. I decided to follow up on this by running a couple of (highly unscientific) tests. In one case, I came up with a script designed to test the interpreter's speed at handling numeric operations. In another case, I wrote a script designed to test string handling and memory management. The results were revealing. I ran a number of trials with each interpreter, using values for terms of 200000, 400000, 600000, 800000, and 1000000. The graph below shows the results (with execution time plotted vertically; the scale ranges from zero to 1800 milliseconds). Numerical efficiency test. Vertical axis represents execution time. Notice that the JRE starts out slower and execution time rises faster than with Rhino (that is, the red line has a steeper slope). This bit of silliness grows a string by concatenating it with itself over and over again, then repeatedly splits the string into an array of characters and rejoins the array to form a string again. If you pass in an iterations value of 20, you'll make the string double in size 20 times, crashing any known version of Rhino with an OOME. Thus, I tested with values of 12 to 17. Execution time topped out at 5047 millisec for the JRE and 2634 ms for Rhino. Again notice that the red curve starts out higher and rises at a steeper slope. I'll say it once more: This is not intended to be a highly scientific set of tests. I believe it to be representative of reality, though, and the reality is, bare-naked Rhino is significantly faster than embedded-in-the-JRE Rhino. You can do whatever you want; I've seen enough data and I've made my decision. Bare-naked is the way to go. Of course, there are many more properties on Annotations than I've captured here. But you get the idea. Not bad for a dozen lines of code. Sure beats messing around with DOM methods, DOM serialization, etc. Praise ye mighty gods on Mt. Olympus: It is, in fact, possible to do AJAX from Acrobat. That's the good news. The rest of the news is (how shall we say?) not entirely salutary, and certainly not well documented. But it's pretty interesting nonetheless. While it's certainly good news that you can do AJAX from Acrobat, Adobe (for whatever reason) has chosen not to follow the well-accepted idiom (in the Web world) of allowing AJAX code to run in the context of a web document. In other words, you can't just put your AJAX code in a PDF (as a field script in a form, say), then serve the PDF and expect to phone home to the server while the user is interacting with the PDF document. Instead, Adobe requires that you put your AJAX calls in a folder-level script, which is to say a static file that lives on your hard drive in a special subpath under your /Acrobat install path. This is roughly the equivalent of Firefox requiring that all AJAX be done in the context of a Greasemonkey script, say, or in the context of Jetpack. Hardly convenient. If you're paying attention, you'll notice right away that this means developing AJAX scripts for Acrobat is potentially rather tedious in that you have to restart Acrobat every time you want to test a change in a script. Something else you're going to notice when you actually get around to testing scripts is that Acrobat pukes (gives a security error) if you don't explicitly tell Acrobat to trust the particular document that's open while you're running the script. This makes relatively little sense to me; after all, if it's a folder script (running outside the document context), why do I have to have a document open at all, and why do I now have to designate that doc as trusted? As we say in aviation, Whiskey Tango Foxtrot. Whatever. Jumping through the hoops is easy enough to do in practice: To specify the doc as trusted, go to the Edit menu and choose Preferences (or just hit Control-K). In the dialog that appears, choose Security (Enhanced) from the list on the left, then click the Add File button and navigate to the document in question. Once you do this, you can run the AJAX code in your folder-level script. But wait. How do you run the script? What's the user gesture for triggering a folder script? 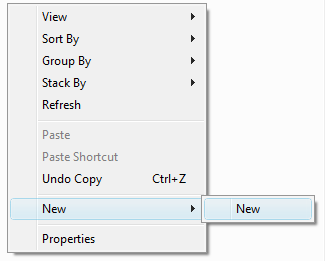 The answer is, you need to include code in the script that puts a new (custom) menu command on the File menu. The user can select that command to run the script. Before going further, let's take note of the fact that the magical Net.HTTP.request() method needs one parameter: a parameter-block object. The parameter block, in turn, needs to have, at a bare minimum, a cURL property (containing a URL string pointing to the server resource you're trying to hit) and a cVerb property (containing one of 'GET', 'POST', 'PUT', 'DELETE', 'OPTIONS', or 'HEAD', or one of the allowed WebDAV verbs, or 'MKCALENDAR'). Optionally, the request block can also have a property called oHandler that will have its response() method called -- asynchronously, of course -- when the server is ready to respond. So the basic notion is: Craft a param block, hand it to the Net.HTTP.request() method, and let params.oHandler.response() get a callback. What's not so well documented by Adobe is what the heck you need to do in order to read a stream object. I'll spare you the suspense: It turns out the stream object is a string containing hex-encoded response data. The easiest way to decode it is to call SOAP.stringFromStream() on the stream, as illustrated above. There's more -- lots more -- to doing AJAX from Acrobat (I haven't yet touched on authentication, for example, or WebDAV, or even how to do POST instead of GET), but these are the basics. If you end up doing something interesting with AcroJAX, be sure to add a comment below. And if you want to know how to do Acrobat AJAX against an Apache Sling repository, watch my blog space at dev.day.com. I'll be writing about that soon. Can you identify the living fossil? There seems to be a growing perception, not unlike the controversies surrounding Flash, that Adobe's Portable Document Format is (in the modern world of the Web) a legacy format, something of a living fossil, a technological Coelacanth that refuses to become extinct. Some would go so far as to say PDF doesn't belong on the Web. Some would be wrong, however. My current employer, Day Software, has (how shall I say this in politically correct form?) a strong prejudice in favor of HTML as the one true and proper Web format for documents. This is reflected in the fact that all of Day's product documentation (like just about everything else Day produces, information-wise) is available online as HTML. There are those at Day, I'm sure, who would like to see PDF disappear from Web sites, if not from planet earth. HTML is a bit of a religion around Day. And yet, when I joined Day as an employee (two weeks ago), not one document in the half-inch-thick stack of new-employee paperwork that I was asked to fill out was based on an HTML form. Every single document was based on a PDF. So what is this walking fossil called PDF and why is it still so pervasive? In the beginning, there was Postscript. Far and away the most successful Adobe technology ever created, Postscript was the first commercially successful page-description language based on vector graphics. It's a Turing-complete language with subroutines, looping, branching, and all the rest. Amazingly, it continues to inhabit printers worldwide. (You probably rely on a Postscript driver to get your printer to work.) It's a brilliant bit of technology, describing, as it does, fonts and shapes and whole pages in resolution-independent terms, in a plain-text (non-binary) interpreted language. Write once, rasterize anywhere. Since fonts themselves can be described in Postscript, and since Postscript is just text, you'd think PS would be the ideal self-contained document format. Alas, it is not. It's far too verbose, and laborious to render onscreen. (This is what killed Display Postscript.) Still, its inherent portability made Postscript a compelling basis for a document format. So Adobe went on a quest to make Postscript smaller and more amenable to quick screen rendering. They reduced the number of operators (and made their names smaller), and cut out subroutines, and eliminated loops, and did a bunch of other things designed to make Postscript small and screen-friendly, yet without sacrificing portability. The result was PDF. The first generation of PDF was ASCII-based, and if you looked inside it you basically saw thinly disguised Postscript commands, with loops unrolled and major page elements described as objects. References to objects were maintained in offset tables. Fonts could be embedded, or not. It was still a somewhat verbose format, but at least it could be interpreted and rendered quickly, onscreen or to a printer. (The translation from PDF to Postscript is extremely straightforward.) Adobe came up with a free Reader program and put PDF files out there for anyone who wanted to give them a try. Lo and behold, the format took off. Why? Why does the world need something like PDF? The (sad, to some) answer is that there is still a need in the world for electronic documents that mimic paper documents. There are industries (such as insurance) in which the physical size and placement of certain pieces of text is regulated by law, and many forms have to fit on a certain size piece of paper when printed out -- there's zero tolerance for text autowrap variations. Form 1040 from IRS has to look like Form 1040, every time. (Imagine the pandemonium at IRS if every tax form that arrived in the mail looked different because it was printed out on a different printer at a different resolution, with text wrapping every which way, all manner of font substitutions, etc.) Like it or not, certain documents have to look a certain way every time, without fail. This is where PDF shines. 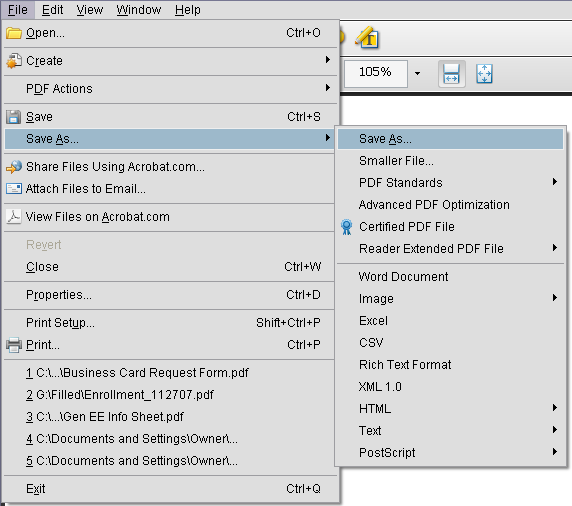 Is PDF right for every occasion? No. It's not. No more than HTML is. Is PDF going to become obsolete? Not any time soon. Not any more than Postscript. Can/should PDF coexist with markup languages in the world of the Web? I think the answer is yes. 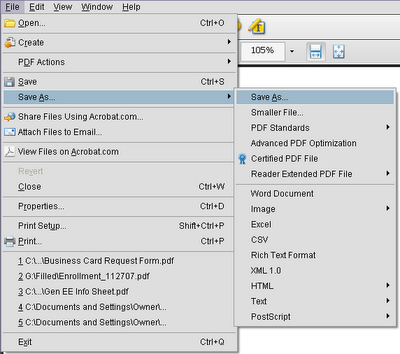 Adobe has done a good job of making online PDF forms (for example) REST-friendly and user-friendly. Having to load Reader (or a Reader plug-in for your browser) is a bit of a hassle, but you do get a lot of bang for the buck. The advantages of PDF tend to balance out the disadvantages -- for certain users, in certain situations. And that's the key. It's not about religion -- it's not about whose document format is inherently better or worse. It's about diversity and choice: choosing the right tool for the job and letting the user (or customer) choose what's right for her. This is the part that the HTML zealots don't get. Some customers want PDF. Some users demand to have documents in a format that looks nice onscreen and prints out nicely (and predictably) on a printer. By not providing those users with that choice, we're (in essence) forcing a technology decision on people. We're forcing our religion on non-converts. And historically, that's always been a dangerous thing to do. Fortunately, there's a workaround. I nearly fell off my barstool when I happened onto it. The second thing you have to know is that every Annotation has a gazillion properties, one of which is the list of quads for the annotation. A quad simply contains the annotation's location in rotated page space. The key intuition here is that every annot has a bounding box (think of it as a rectangle) with an upper left corner, an upper right corner, and so on (duh). Each corner has x,y coordinates in page space (double duh). 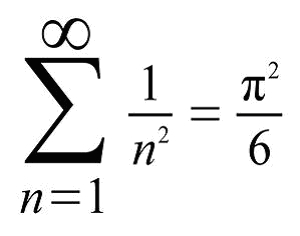 Since there are four corners and two coords for each, we're talking about eight floating-point numbers per quadrilateral (i.e., per quad). We can safely compare quad coords for exact equality thanks to the fact that when Acrobat puts a Highlight annot on a page, it sets the annot's quad location to (exactly) the word's location. There's no "off by .0000001" type of situation to worry about. I tested the above function in Acrobat 9 using Highlight annotations and (voila!) it seems to work. Is it just me, or does anyone else see the illogical nature of having a menu command that leads to a submenu command of exactly the same name? Save As > Save As makes no sense to me. Does it make sense to you? 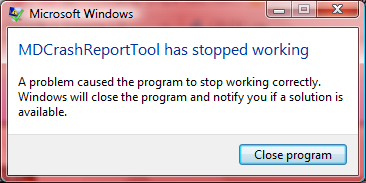 In the above case, the perpetrator is Adobe. I entered bug 2642169 in the appropriate bug-tracking system; hopefully it will get fixed. There are other problems with the above menus. Some of the commands need to have an ellipsis ("...") after them because they lead to dialogs rather than having an immediate effect. But that's minor (IMHO) compared to Save As > Save As. The perpetrator in this case is Microsoft. Somehow (and I don't remember what I did, exactly), I got to this weird menu situation in Vista's Explorer while doing a desktop operation. Obviously, New > New makes no sense. I could cite a third example, but I think you get the point. Don't have menu commands that go to submenu commands of the same exact name. It's illogical and it looks funny. It's not what nature intended. I keep running into situations in user interfaces for well-known products where the Cancel button is misused. A typical scenario involves a configuration dialog, one that perhaps has several tabs. Because there are so many configuration options, you might spend several minutes on this one dialog, checking checkboxes and entering string values. When you're done, you look for a Done button -- and find none. Is there a Finish button, perhaps? No. An "Accept These Settings" button? No. Just a Cancel button. Do you see what's wrong with this picture? Cancel does not mean Done. It does not mean "I'm finished now, so accept my changes and save my work and dismiss this dialog." Let's be clear, Cancel means (or should mean) one thing only: Let me back out of the current operation as if nothing had happened. UI designers, take note. Please. Don't make me use "Cancel" to get out of a dialog after I know I've just made important changes to the state of the program.